I’m all about using whatever’s nearby and accessible, but I tend to keep at least a few of these around: Micron Pens, Pentalic graphite, Wacom Intuos 4 tablet, Akashiya brush pens. What books have you made? I have made 18 books. The newest is an activity book, where each page is a different comic that the reader has to complete in a different way. It’s called Let’s Make Comics, and it debuted at #1 on Amazon in 4 categories. Yep! I graduated with a BFA in Illustration and Design in 2008, and my work has been published in dozens of books, magazines, and websites across the globe. Do you suffer from undiagnosed debilitating pain that keeps you in bed all day and using a walker or a cane when you visit the doctor? Most publishers have a “submission” section on their website, where you can find their submission guidelines. Some want complete manuscripts, others want a writing sample and synopsis, while others just want a selection of finished pages. Find out which publishers are putting out books that are similar to yours and get in touch with them. Self-publishing is also an option. Will you visit my school/library/bookstore? Yes—but it’ll have to wait until my health improves. Right now I’m drawing myself crazy, making art for games, books, graphic novels, and I’m writing some long-form fiction and non-fiction (which I’m completely freaking out about). 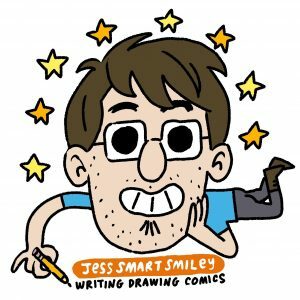 How do we sign up for the Comics Workshop this summer? Hi Dianna! Registration for the Comics Workshop is now available via the Higher Ground website (https://continue.utah.edu/youth/class/yeart_319_a_graphic_novel_this_way_comes_age_13_18). The fun begins on June 9! Let me know if you have any other questions.